so, i got this old acoustic guitar that i got from my mom..
its bought sometime in the 70's and its an "Orfeo" guitar. I was wondering if anybody has heard about orfeo cause i can not find anything about that anywhere. The guitar is an regular western with the hummingbird on it..
Hmm, I will name that guitar Alfred. wow you definately stumped me there, ive never heard of that kind of guitar. Now I will actually be helpful - I Googled Orfeo guitars and couldn't find anything about them, so it's probably just some small company that made cheap guitars. 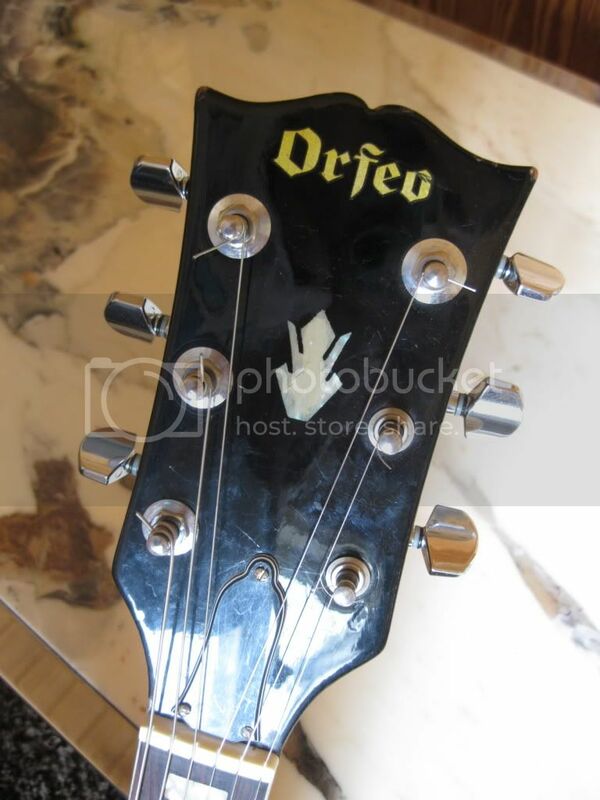 I've seen "Orpheo" or "Orpheus" guitars before but not Orfeo. First, welcome to GTU. That's consistent with back when some guitars were first being copied in the Orient, you'd find inexpensive guitars where the logo wasn't quite the same as the original manufacturer's. Sometimes they would be phonetic mistakes, or sometimes simple visual mistakes made by someone not familiar enough with the English lanuage or alphabet. For example I have seen Oriental-made "Gidson" guitars (a flipped around d) and "Vocks" guitars (instead of an x) and even a "Wartin" (I think the W was a mistakenly made upside down M). So being logo'ed Orfeo is consistent with mistakes like that in trying to copy an Orpheo or Orpheus. So, we baught an Orfeo guitar for about 50 norwegian kroner (wich ecuals 10$). It is a very nice, jumbo, acoustic guitar from the late 60's, but we never really knew where it came from since we coudn't find any information about it. So, my Godfather, who is an excellent guitarplayer, managed to find some backroud history about this guitar. He found out that it was worth around 25,000 kroner (5000$), and was NOT a cheep made model. twenty years without beeing used other than on late after-parties, so it needs a little bit fixing. But I just had to get this information out there, so if you have one, take good care of it! Orfeo was probably a distributor's name rather than a maker's. I think I've seen one or two similar specimens over the years, also with a black finish. They were inexpensive, mass-produced instruments when new, and now they're just old inexpensive, mass-produced guitars. They have no interest among players or collectors. But so what? If it suits your ears, hands, and eyes, that's all you can ask of any guitar, regardless of value or price. If it's actually been in an attic for 20 years, extremes of heat, cold, and humidity have very likely inflicted multiple mortal wounds. For the price of professional repairs, you could probably get a nicer new guitar. If, by some miracle, it still stays in tune and plays OK, take care of it, and Have Fun with it. I doubt that the same Japanese knock-off company would sell inexpensive LP copies and also, conversely, extremely valuable fine Hummingbird copies. I agree with "Bill" above when he says... "But so what? If it suits your ears, hands, and eyes, that's all you can ask of any guitar, regardless of value or price... If, by some miracle, it still stays in tune and plays OK, take care of it, and Have Fun with it." Couple of weeks ago, I got me this sweet old lady form e-bay. What can I say...the looks, the quality and the sound of the guitar are just marvelous!!! However, I have NO IDEA who made this sweet SG-Copy, where it comes from (Japan?? 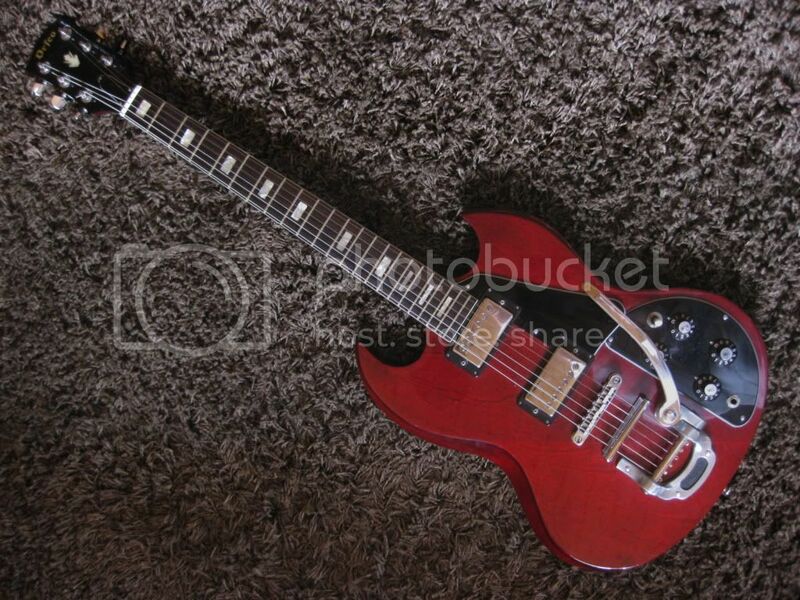 � perhaps built in one of the IBANEZ factories), when it was built (70s?? ), and what it actually may be worth I have never heard of the "brand", or distributor ORFEO! Now, my question to all of you experts out there in this forum is: Does anyone have any information about that instrument? Any guesses at least? I've browsed the internet & asked the Google-oracle thousands of times now...but never got any answer! Hi there folks. First time here. I got mine Orfeo SG in early 80s here in Brasil, purchased as an used 70s Japanese guitar. And played her for 16 years in a bunch of rocknroll bands down here. Sounded always great with a single overdrive and a digitaldelay. And goes very good on clean nerly jazzy style. I've seen 3 pcs of a model: hurryhomehoney's, mine and another sold in used guitar store down here. I have one ORFEO classical nylon string guitar too. I bought it cheap at a second hand place and it is a fine guitar. Even if it isn't worth much, it is still hard to find, so it is a rare instrument and very valuable to me. (ORFEO Model DC-103). I also have a KUMIKA guitar as well. Very beautiful and also very rare. It is a steel stringed instrument, with flowers on the edge of the guitar. (KUMIKA Model W 800). I will never sell them!! I have seen an Orfeo, which looks like a Martin D-35 copy. mid 70s, most likely Matsumoko, or similar. Puts me very strongly in mind of Terada, or Morris, which are most definitely collectible. Not really. I have seen an Orfeo that was a Martin copy, and it was beyond stunning. Very much not a cheap knock-off. It might not have the same cachet as other makes, but I suspect that this may be from the same factory as Morris guitars. These are known to be pretty decent and are certainly collectible. Just my two cents, as it were, but I would hang on to the Orfeo.